Home » young's » The Recurrent Recurrent Nosebleed Treatment - Sewing the Nostril Shut! The Recurrent Recurrent Nosebleed Treatment - Sewing the Nostril Shut! This is often the situation with patients suffering from HHT (Hereditary Hemorrhagic Telengietasia), though can occur in individuals for other medical reasons resulting in very low platelet and coagulation values (liver failure, blood-thinning medications, etc). This situation often calls for the "big" guns in treatment, namely the Young's Anterior Nostril Closure. First described in 1961 (see references below), the procedure is to essentially sew the nostril completely shut. By completely obstructing airflow, any drying effects are eliminated and not uncommonly, the nosebleeds are finally "cured." Understandably, very few patients would be able to tolerate this course of action which should be considered "permanent." With re-creating the nostril opening, the nosebleeds may recur again. But for such individuals, the advantages outweigh the disadvantages. 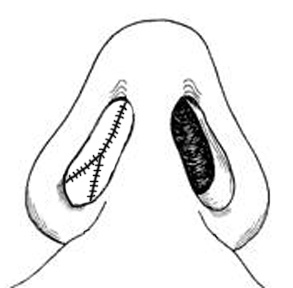 If only one nostril is to be sewn shut, there should be no septal perforation present, otherwise, both sides need to be closed if this intervention is to work. Nasal packing accomplishes the same thing in that complete nasal obstruction is accomplished, but will create a toxic bacterial infection if left in place for too long, so is considered only a temporary measure in such patients. Furthermore, removal would only exacerbate any nosebleeds in such nosebleed crippled patients. Of course, with these two alternative methods, the cotton ball or saran wrap needs to be changed out on a regular basis. Indeed, most patients will elect for sewed nostril closure only after finding significant relief with continuous complete nasal obstruction with saran wrap or cotton balls. Closure of the nasal cavities in the treatment of refractory hereditary hemorrhagic telangiectasia. Journal Laryngol Otol. 1997; 111:30-33. Histopathological and histochemical studies on atrophic rhinitis. Journal Laryngol Otol. 1961; 75:574-590. Closure of the nostrils in atrophic rhinitis. Journal Laryngol Otol. 1967; 81:515-524. Young's procedure in the treatment of epistaxis. Journal of Laryngology and Otology 1991; 105:847-848. Hereditary haemorrhagic telangiectasia: Young's procedure in the management of epistaxis. J Laryngol Otol. 1994 Sep;108(9):754-7. The Young's procedure for severe epistaxis from hereditary hemorrhagic telangiectasia. Am J Rhinol Allergy. 2012 Sep-Oct;26(5):401-4. doi: 10.2500/ajra.2012.26.3809. Hereditary haemorrhagic telangiectasia: Young's procedure in the management of epistaxis. Journal of Laryngology and Otology 1994; 108: 754-757.